β-Carboline- or tryptoline-derived alkaloids [¹-³] are a large class of compounds that show a wide variety of biological and therapeutic activities (Figure [¹] ). [4-6] The two antihypertensives, reserpine and ajmalicine, are typical examples of this family of molecules.7-9 Many synthetic strategies have been developed to arrive at substituted indoles and tryptamines, [¹0-¹²] with Pictet-Spengler and Mannich type condensation reactions being among the most prominent. [¹³-¹5] However, these methods are limited by the fact that indoles carrying electron-donating groups are required and there are restrictions to the groups that can be introduced via the aldehyde/imine coupling partner. We have recently disclosed the first asymmetric intramolecular allylic amidation to give tetrahydroisoquinolines, [¹6] based on an iridium-catalyzed allylic substitution reaction [¹7-²²] with phosphoramidite ligands. [²³] In this protocol, the dual function of the trifluoroacetamide group is crucial, as it serves both as a protecting group and as the actual nucleophile in the key ring-closing transformation. We were interested in expanding this methodology to the synthesis of the important class of β-carbolines. This reaction should be independent of the electronic demands of the indole moiety and, at the same time, deliver a terminal double bond, which is ideal for further functionalization such as ring annulation (Scheme [¹] ). Together with the amide functionality, which should easily lead to the unprotected amines, our synthetic approach was expected to provide highly functional building blocks for the synthesis of complex molecules featuring the β-carboline structural unit. Here, we present a new route to β-carbolines that exploits the different aspects of reactivity of the trifluoroacetamide group. It was used as a protecting group during a palladium-catalyzed Stille coupling and was also shown to act as a nucleophile in the allylic substitution reaction. Our synthetic approach started from commercially available tryptamines 1 (Scheme [²] ). After benzyl protection of the indole nitrogen and trifluoroacetylation of the primary amine, the protected tryptamines 3 were obtained in very good yields. Furthermore, trifluoroacetamide 4, without a substituent at the indole nitrogen, was also synthesized. We then investigated the possible iodination of 3 and 4 at the 2-position of the indole system. The reported mercury-mediated iodination [²4] proved to be feasible on a small scale, however, in our case this proved to be difficult when scaling up the reactions. As an alternative, we explored the use of iodine monochloride as the iodination agent, which we had successfully applied to electron-rich phenylethylamine derivatives.¹6 In the case of tryptamines 3a and 4, this did not prove to be a viable synthetic pathway, because the corresponding chlorides 5 were isolated (Scheme [³] ). The subsequent Stille reaction (see also Scheme  below) with stannane 6 showed no turnover with chlorides 5. The synthesis of the desired iodoindoles 7, which were key intermediates for the envisaged palladium-catalyzed carbon-carbon coupling reaction later on in the synthetic route, was carried out using a lithiation/iodination protocol (Scheme  ). Iodo-substituted indoles 7 were obtained in moderate yields. [²5] For the subsequent cross-coupling, the role of the trifluoroacetamide group as a protecting group was exploited. Since palladium-catalyzed coupling only rarely proceeds in the presence of primary amines, this feature could be used to our advantage. In the next step, the allylic alcohol moiety was introduced through Stille coupling with stannane 6. [²6] In the case of iodides 7, the coupling proceeded smoothly to give the desired allylic alcohols 8 (68-71% yield), which could be transformed into the desired methyl carbonates 9 in a straightforward manner (Scheme  ). With the starting materials 9 for the allylic amidation in hand, a method was developed for the selective ring-closing allylic amidation to give β-carbolines 10 (Scheme  ). After screening the reaction conditions, it was found that cesium carbonate in dioxane at 100 ˚C gave the best outcome for this transformation in terms of yields. When carbonates 9 were heated to 100 ˚C in the presence of cesium carbonate, the corresponding tricyclic compounds 10, bearing a vinyl moiety and an easy-to-deprotect trifluoroacetamide, were obtained in yields of up to 82%. Among the other bases investigated, 1,8-diazabicyclo[5.4.0]undec-7-ene (DBU) and 1,4-diazabicyclo[2.2.2]octane (DABCO) gave low conversion (10 and 50%, respectively) under the reaction conditions, whereas 1,5,7-triazabicyclo[4.4.0]dec-5-ene (TBD) led to decomposition of the allylic carbonate 9. Other inorganic bases, such as K3PO4, gave no conversion, whereas the use of sodium hydride as a base led to deprotection of the allylic carbonate to give the corresponding alcohols 8. The use of cesium carbonate at lower reaction temperature led to considerably lower conversion of 9 (10% conversion at 90 ˚C), and no reaction took place at 50 ˚C. It should be noted that the allylic amidation could also be carried out by employing microwave heating (300 W), which led to shortening of the reaction time (2 h compared to 16 h under standard conditions), while retaining similar yields. All attempts to render this transformation asymmetric by the use of iridium [¹6] or palladium [²7] catalysis have so far been fruitless. With this allylic amidation, we have exploited the nucleophilic nature of the trifluoroacetic amide of 9. β-Carbolines 10 are highly versatile building blocks for the synthesis of more complex structures, allowing the generation of a variety of molecules featuring a β-carboline core. It is interesting to note that products 10 were isolated as mixtures of isomers/rotamers. Whereas 10a gave rise to two distinct resonances in the ¹9F NMR spectrum, which we attribute to the E/Z isomers of the trifluoroacetamide, 10b and 10c generated a set of four signals in the ¹9F NMR spectra. These additional NMR absorptions were assigned to two rotamers resulting from hindered rotation of the benzyl protecting group. To probe this hypothesis, we have conducted variable temperature ¹9F NMR spectroscopic measurements of 10b (Figure [²] ). From the data shown in Figure [²] it can be seen that two signals (peaks 1 and 3) coalesce at 80 ˚C, as expected for rotamers. The fourth signal (Figure [²] , peak 4) gradually disappears at higher temperatures, a phenomenon that can be attributed to E/Z isomers since, at higher temperatures, the thermodynamically more stable species (peak 2 at δ = -68.2 ppm in Figure [²] ) should be prevalent in the mixture. In summary, we have developed a new, straightforward synthetic pathway towards substituted β-carbolines, which are important, multifunctional building blocks for further syntheses of complex molecules. In our approach, we exploit the various reactivities of the trifluoroacetic amide moiety as a directing group, a protecting group, as well as a nucleophile in the key allylic amidation step. The products obtained carry a terminal olefin as well as a protected secondary amine, which open up possibilities for a multitude of subsequent transformations, rendering these new building blocks highly versatile. The appropriate tryptamine 1 (1.00 equiv) was dissolved in DMF (10 mL/mmol) at 50 ˚C and added to a stirred solution of NaH (1.10 equiv) in DMF (10 mL/mmol) and the mixture was stirred for 30 min. BnBr or MeI (1.10 equiv) was added dropwise. After stirring at 50 ˚C for 1 h, the reaction was quenched with H2O (10 mL/mmol) and the mixture was extracted with EtOAc (3 × 10 mL/mmol). After drying over MgSO4 and removal of all volatiles, N-substituted tryptamines 2 were obtained as yellow/orange solids, which were used without further purification. N-Protected tryptamine 2 (1.00 equiv) was dissolved in CH2Cl2 (2.5 mL/mmol) and the solution was cooled to 0 ˚C. Pyridine (1.05 equiv) was added and, subsequently, 2,2,2-trifluoroacetic anhydride (1.05 equiv) was added dropwise. The mixture was allowed to warm to r.t. and stirred for 16 h. After completion, the mixture was washed with aq 2 M HCl (3 × 2 mL/mmol) and dried over MgSO4. After filtration and removal of all volatiles under reduced pressure, the crude product 3 was obtained, which was used without further purification. Obtained according to general procedure A from 2a (1.00 equiv, 3.48 g, 20 mmol). Yield: 4.70 g (17.40 mmol, 87%); brown solid. ¹H NMR (201 MHz, CDCl3): δ = 7.59 (d, J = 7.8 Hz, 1 H), 7.42-7.09 (m, 3 H), 6.91 (s, 1 H), 6.70-6.30 (br s, 1 H), 3.76 (s, 3 H), 3.68 (dd, J = 12.9, 6.5 Hz, 2 H), 3.15-2.97 (m, 2 H). ¹³C NMR (50 MHz, CDCl3): δ = 137.18, 127.37, 126.91, 121.98, 119.16, 118.50, 110.14, 109.44, 40.28, 32.61, 24.56. COCF3 peaks not observed. ¹9F NMR (189 MHz, CDCl3): δ = -76.00. HRMS (ESI+): m/z [M + H+] calcd for C13H14F3N2O: 271.1053; found: 271.1035. Obtained according to general procedure A from 2b (1.00 equiv, 5.01 g, 20 mmol). Yield: 6.44 g (18.60 mmol, 93%); brown solid. ¹H NMR (201 MHz, CDCl3): δ = 7.81-7.59 (m, 1 H), 7.51-7.11 (m, 8 H), 7.09-6.90 (m, 2 H), 5.31 (s, 2 H), 3.73 (dd, J = 13.1, 6.7 Hz, 2 H), 3.12 (t, J = 7.0 Hz, 2 H). ¹³C NMR (50 MHz, CDCl3): δ = 137.24, 136.68, 128.77, 128.60, 127.58, 127.51, 126.66, 126.13, 122.00, 119.26, 118.59, 110.84, 109.80, 49.68, 40.04, 24.41. COCF3 peaks not observed. ¹9F NMR (189 MHz, CDCl3): δ = -75.74. HRMS (APCI): m/z [M + H+] calcd for C19H18F3N2O: 347.1366; found: 347.1361. Obtained according to general procedure A from 2c (1.00 equiv, 1.475 g, 5.26 mmol). Yield: 1.657 g (4.40 mmol, 84%); orange solid. ¹H NMR (400 MHz, CDCl3): δ = 7.35-7.22 (m, 2 H), 7.18 (d, J = 8.9 Hz, 1 H), 7.10 (d, J = 6.5 Hz, 2 H), 7.02 (s, 1 H), 6.95 (s, 1 H), 6.91-6.83 (m, 1 H), 6.41 (br s, 1 H), 5.25 (s, 2 H), 3.86 (s, 3 H), 3.68 (dd, J = 12.7, 6.4 Hz, 2 H), 3.02 (t, J = 6.6 Hz, 2 H). ¹³C NMR (101 MHz, CDCl3): δ = 154.13, 137.31, 132.10, 128.77, 127.89, 127.69, 126.85, 126.73, 112.47, 110.83, 110.23, 100.32, 55.85, 50.14, 40.00, 24.64. COCF3 peaks not observed. ¹9F NMR (376 MHz, CDCl3): δ = -75.97. HRMS (ESI+): m/z [M + Na+] calcd for C20H19F3N2O2Na: 399.1291; found: 399.1277. Tryptamine (1.00 equiv, 1.00 g, 6.24 mmol) was dissolved in CH2Cl2 (50 mL) and the solution was cooled to 0 ˚C. Pyridine (0.530 mL, 6.55 mmol, 4.00 equiv) was added and, subsequently, trifluoroacetic anhydride (0.926 mL, 6.55 mmol, 5.00 equiv) was added dropwise. The mixture was allowed to warm to r.t. and stirred for 16 h. After completion (reaction monitored by TLC), the mixture was washed with aq 2 M HCl (3 × 10 mL) and dried over MgSO4, filtered, and all volatiles were removed under reduced pressure to give 4, which was used without further purification. Yield: 1.567 g (6.12 mmol, 98%); brown solid. ¹H NMR (201 MHz, CDCl3): δ = 8.46 (br s, 1 H), 7.71 (d, J = 7.6 Hz, 1 H), 7.51-7.20 (m, 3 H), 7.17-6.97 (m, 2 H), 3.70 (q, J = 6.6 Hz, 2 H), 3.10 (t, J = 6.9 Hz, 2 H). ¹³C NMR (50 MHz, CDCl3): δ = 157.40 (q, J = 36.9 Hz), 136.31, 126.85, 122.28, 122.02, 119.31, 118.19, 115.84 (q, J = 286.8 Hz), 111.36, 111.29, 40.17, 24.31. ¹9F NMR (189 MHz, CDCl3): δ = -75.89. HRMS (ESI+): m/z [M + H+] calcd for C12H12F3N2O: 257.0896; found: 257.0877. Trifluoracetamide 4 or 3a (1.00 equiv) was dissolved in CH2Cl2 (10 mL/mmol) at 21 ˚C, and a solution of iodine monochloride (1 N in CH2Cl2, 1.10 equiv) was added dropwise. The reaction mixture was stirred at this temperature until full conversion was reached (reaction monitored by TLC). The mixture was washed with H2O (10 mL/mmol) and brine (10 mL/mmol), and the organic phases were dried over MgSO4. Removal of all volatiles and purification by column chromatography gave 5. Obtained according to general procedure B from 4 (1.00 equiv, 2.00 g, 7.81 mmol) after purification by column chromatography (SiO2; pentane-EtOAc, 10:1). Yield: 1.807 g (6.22 mmol, 80%); light-brown solid; R f = 0.75 (pentane-EtOAc, 8:2). ¹H NMR (201 MHz, CDCl3): δ = 8.43 (br s, 1 H), 7.56-7.43 (m, 1 H), 7.38-7.06 (m, 3 H), 6.60 (br s, 1 H), 3.64 (q, J = 6.5 Hz, 2 H), 3.03 (t, J = 6.6 Hz, 2 H). ¹³C NMR (50 MHz, CDCl3): δ = 134.49, 127.08, 122.64, 121.71, 120.46, 117.68, 110.75, 107.79, 39.77, 23.15. COCF3 resonances not observed. ¹9F NMR (189 MHz, CDCl3): δ = -76.06. HRMS (APCI): m/z [M - Cl-] calcd for C12H1oF3N2O: 255.0745; found: 255.0737. Obtained according to general procedure B from 3a (1.00 equiv, 1.920 g, 7.10 mmol) after purification by column chromatography (SiO2; pentane-EtOAc, 10:1). Yield: 1.688 g (5.54 mmol, 78%); yellow solid; R f = 0.80 (pentane-EtOAc, 8:2). ¹H NMR (201 MHz, CDCl3): δ = 7.52 (d, J = 7.6 Hz, 1 H), 7.35-7.25 (m, 2 H), 7.24-7.08 (m, 1 H), 6.48 (br s, 1 H), 3.74 (d, J = 2.5 Hz, 3 H), 3.64 (q, J = 6.4 Hz, 2 H), 3.06 (t, J = 6.6 Hz, 2 H). ¹³C NMR (50 MHz, CDCl3): δ = 135.82, 126.20, 124.50, 122.22, 120.19, 117.70, 109.30, 106.86, 39.87, 29.89, 23.58. COCF3 resonances not observed. HRMS (APCI): m/z [M - Cl-] calcd for C13H12F3N2O: 269.0902; found: 269.0894. Trifluoroacetamide 3 (1.00 equiv) was dissolved in Et2O (5 mL/mmol) and cooled to 0 ˚C. BuLi (1.6 M in hexanes, 2.50 equiv) was added dropwise and the reaction mixture was allowed to warm to r.t. After 2 h, the reaction mixture was cooled to 0 ˚C, and iodine (1.50 equiv) was added. After warming to r.t., the reaction was quenched by addition of sat. aq Na2S2O3 (5 mL/mmol), washed with H2O (3 × 5 mL/mmol) and extracted with Et2O (3 × 5 mL/mmol). After drying over MgSO4, all volatiles were removed under reduced pressure. Purification of the crude mixture by column chromatography gave the desired products 7. Obtained according to general procedure C from 3a (1.00 equiv, 0.500 g, 1.850 mmol) and purified by column chromatography (SiO2; pentane-EtOAc, 8:2). Yield: 0.403 g (1.018 mmol, 55%); white solid; R f = 0.80 (pentane-EtOAc, 8:2). ¹H NMR (201 MHz, CDCl3): δ = 7.60 (d, J = 7.6 Hz, 1 H), 7.32 (t, J = 8.3 Hz, 1 H), 7.18 (dd, J = 15.9, 7.9 Hz, 2 H), 7.07 (br s, 1 H), 3.75 (s, 3 H), 3.65 (q, J = 6.7 Hz, 2 H), 3.09 (t, J = 6.9 Hz, 2 H). ¹³C NMR (50 MHz, CDCl3): δ = 159.29 (q, J = 36.8 Hz), 138.40, 127.36, 122.03, 119.50, 117.49, 116.63, 115.76 (q, J = 288.6 Hz), 109.69, 87.84, 39.92, 33.99, 26.61. ¹9F NMR (189 MHz, CDCl3): δ = -75.67. HRMS (APCI): m/z [M + H+ - I] calcd for C13H13F3N2O: 270.0980; found: 269.9763. 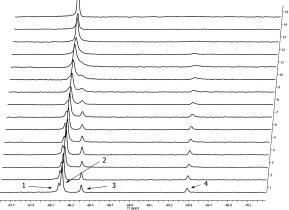 Obtained according to general procedure C from 3b (1.00 equiv, 2.00 g, 5.77 mmol) and purified by column chromatography (SiO2; pentane-EtOAc, 10:1). Yield: 1.309 g (2.77 mmol, 48%); white solid; R f = 0.66 (pentane-EtOAc, 10:1). ¹H NMR (201 MHz, CDCl3): δ = 7.64-7.51 (m, 1 H), 7.37-7.21 (m, 4 H), 7.20-7.09 (m, 2 H), 7.07-6.97 (m, 2 H), 6.35 (br s, 1 H), 5.44 (s, 2 H), 3.69 (q, J = 6.4 Hz, 2 H), 3.11 (t, J = 6.6 Hz, 2 H). ¹³C NMR (101 MHz, CDCl3): δ = 157.21 (q, J = 36.4 Hz), 138.37, 136.87, 128.65, 127.78, 127.44, 126.24, 122.48, 119.99, 117.74, 117.44, 115.75 (q, J = 286.8 Hz), 110.34, 87.87, 50.60, 39.87, 26.83. ¹9F NMR (376 MHz, CDCl3): δ = -75.77. HRMS (APCI): m/z [M + H+ - I] calcd for C19H17F3N2O: 346.1293; found: 346.0073. Obtained according to general procedure C from 3c (1.00 equiv, 1.657 g, 4.40 mmol) and purified by column chromatography (SiO2; pentane-EtOAc, 10:1). Yield: 1.150 g (2.289 mmol, 52%); white solid; R f = 0.55 (pentane-EtOAc, 10:1). ¹H NMR (201 MHz, CDCl3): δ = 7.43-7.21 (m, 4 H), 7.15 (d, J = 8.9 Hz, 1 H), 7.01 (dd, J = 9.3, 2.5 Hz, 2 H), 6.78 (dd, J = 8.9, 2.4 Hz, 1 H), 6.37 (br s, 1 H), 5.39 (s, 2 H), 3.84 (s, 3 H), 3.68 (dd, J = 12.7, 6.4 Hz, 2 H), 3.07 (t, J = 6.6 Hz, 2 H). ¹³C NMR (50 MHz, CDCl3): δ = 154.41, 137.00, 133.78, 128.76, 128.56, 127.55, 126.98, 126.27, 116.70, 112.81, 111.30, 99.36, 55.79, 50.92, 39.88, 26.88. COCF3 resonances not observed. ¹9F NMR (189 MHz, CDCl3): δ = -75.88. HRMS (ESI+): m/z [M + Na+] calcd for C20H18F3IN2O2Na: 525.0257; found: 525.0236. Iodide 7 (1.00 equiv), (E)-3-(tributylstannyl)prop-2-en-1-ol (6; 1.50 equiv), bis(triphenylphosphine)palladium(II) chloride (5.0 mol%) and LiCl (3.0 equiv) were dissolved in DMF (20 mL/mmol) and the mixture was heated to 75 ˚C for 16 h. The reaction was quenched by addition of H2O (20 mL/mmol), EtOAc (20 mL/mmol) was added, and the organic phases were washed with brine (20 mL/mmol). After drying over MgSO4 and removal of all volatiles, the crude product was purified by column chromatography to give 8. Obtained according to general procedure D from 7a (1.00 equiv, 0.300 g, 0.757 mmol) and purified by column chromatography (SiO2; pentane-EtOAc, 1:1). Yield: 0.167 g (0.512 mmol, 68%); orange solid; R f = 0.30 (pentane-EtOAc, 1:1). ¹H NMR (201 MHz, CDCl3): δ = 7.58 (dd, J = 7.8, 0.7 Hz, 1 H), 7.44-7.22 (m, 3 H), 7.20-7.07 (m, 1 H), 6.69 (d, J = 16.3 Hz, 1 H), 6.29 (dd, J = 13.4, 8.1 Hz, 1 H), 4.40 (d, J = 5.3 Hz, 2 H), 3.69 (s, 3 H), 3.59 (dd, J = 13.7, 6.8 Hz, 2 H), 3.14 (t, J = 7.3 Hz, 2 H). ¹³C NMR (50 MHz, CDCl3): δ = 157.44 (q, J = 37.3 Hz), 137.16, 134.46, 133.84, 127.26, 122.17, 119.43, 118.92, 118.09, 115.78 (q, J = 287.9 Hz), 109.19, 109.09, 63.31, 40.45, 30.42, 23.92. HRMS (APCI+): m/z [M + H+] calcd for C16H18F3N2O2: 327.1320; found: 325.1147. Obtained according to general procedure D from 7b (1.00 equiv, 0.285 g, 0.604 mmol) and purified by column chromatography (SiO2; pentane-EtOAc, 1:1). Yield: 0.172 g (0.427 mmol, 71%); white solid; R f = 0.50 (pentane-EtOAc, 1:1). ¹H NMR (400 MHz, CDCl3): δ = 7.59 (d, J = 7.7 Hz, 1 H), 7.33-7.10 (m, 6 H), 7.00 (d, J = 7.0 Hz, 2 H), 6.71-6.54 (m, 2 H), 6.18 (dt, J = 16.1, 5.3 Hz, 1 H), 5.37 (s, 2 H), 4.28 (d, J = 5.2 Hz, 2 H), 3.65 (dd, J = 13.4, 6.8 Hz, 2 H), 3.19 (t, J = 7.1 Hz, 2 H). ¹³C NMR (101 MHz, CDCl3): δ = 137.61, 137.15, 134.73, 134.59, 128.80, 127.56, 127.37, 125.87, 122.68, 119.98, 118.80, 118.33, 109.88, 109.60, 63.47, 47.31, 40.42, 24.04. COCF3 resonances not observed. ¹9F NMR (376 MHz, CDCl3): δ = -76.00. HRMS (ESI+): m/z [M + Na+] calcd for C22H21F3N2O2Na: 425.1447; found: 425.1432. Obtained according to general procedure D from 7c (1.00 equiv, 0.270 g, 0.538 mmol) and purified by column chromatography (SiO2; pentane-EtOAc, 1:1). Yield: 0.158 g (0.366 mmol, 68%); white solid; R f = 0.5 (pentane-EtOAc, 1:1). ¹H NMR (400 MHz, CDCl3): δ = 7.26 (d, J = 6.7 Hz, 3 H), 7.08 (d, J = 8.6 Hz, 1 H), 7.03 (s, 1 H), 6.98 (d, J = 6.0 Hz, 2 H), 6.91 (br s, 1 H), 6.83 (d, J = 8.2 Hz, 1 H), 6.58 (d, J = 16.2 Hz, 1 H), 6.15 (d, J = 15.8 Hz, 1 H), 5.31 (s, 2 H), 4.25 (s, 2 H), 3.85 (s, 3 H), 3.62 (d, J = 5.6 Hz, 2 H), 3.14 (br s, 2 H). ¹³C NMR (101 MHz, CDCl3): δ = 157.38 (q, J = 37.6 Hz), 154.40, 137.70, 135.12, 134.11, 132.39, 128.75, 127.92, 127.30, 125.80, 118.89, 115.83 (q, J = 287.4 Hz), 112.75, 110.70, 109.22, 100.08, 63.40, 55.83, 47.34, 40.29, 24.06. ¹9F NMR (376 MHz, CDCl3): δ = -75.94. HRMS (ESI+): m/z [M + Na+] calcd for C23H23F3N2O3Na: 455.1553; found: 455.1539. The appropriate allylic alcohol 8 (1.00 equiv) and anhydrous pyridine (1.50 equiv) were dissolved in CH2Cl2 (2 mL/mmol) and the reaction mixture was cooled to 0 ˚C. Methyl chloroformate (1.10 equiv) was added dropwise and the reaction mixture was stirred for 16 h, while allowing it to warm to 21 ˚C. When TLC indicated full conversion of the starting material, the mixture was washed with aq 2 M HCl (3 × 2 mL/mmol) and dried over MgSO4. After filtration and removal of all volatiles under reduced pressure, the desired products 9 were obtained in sufficient purity. Obtained according to general procedure E from 8a (1.00 equiv, 0.160 g, 0.490 mmol). Yield: 0.185 g (0.481 mmol, 98%); yellow foam. ¹H NMR (400 MHz, CDCl3): δ = 7.62-7.55 (m, 1 H), 7.32-7.25 (m, 2 H), 7.17-7.10 (m, 1 H), 6.84-6.72 (m, 2 H), 6.19 (dt, J = 16.2, 6.2 Hz, 1 H), 4.85 (dd, J = 6.2, 1.4 Hz, 2 H), 3.83-3.82 (s, 2 H), 3.73 (s, 3 H), 3.60 (q, J = 6.8 Hz, 2 H), 3.13 (t, J = 7.1 Hz, 2 H). ¹³C NMR (101 MHz, CDCl3): δ = 157.14 (q, J = 36.5 Hz), 155.47, 137.51, 133.42, 127.18, 126.88, 122.84, 122.70, 119.66, 118.37, 115.73 (q, J = 288.2 Hz), 110.40, 109.30, 68.29, 54.78, 40.41, 30.70, 23.96. ¹9F NMR (376 MHz, CDCl3): δ = -75.98. HRMS (APCI): m/z [M - OCO2Me] calcd for C16H16F3N2O: 309.1215; found: 309.1199. Obtained according to general procedure E from 8b (1.00 equiv, 0.230 g, 0.572 mmol). Yield: 0.257 g (0.558 mmol, 98%); yellow foam. ¹H NMR (201 MHz, CDCl3): δ = 7.65 (d, J = 6.9 Hz, 1 H), 7.41-7.10 (m, 6 H), 7.09-6.98 (m, 2 H), 7.10-6.95 (m, 2 H), 6.12 (dt, J = 16.2, 6.1 Hz, 1 H), 5.38 (s, 2 H), 4.76 (d, J = 6.1 Hz, 2 H), 3.79 (s, 3 H), 3.66 (dd, J = 13.2, 6.7 Hz, 2 H), 3.19 (t, J = 7.0 Hz, 2 H). ¹³C NMR (50 MHz, CDCl3): δ = 155.39, 137.39, 137.36, 133.54, 128.74, 127.53, 127.47, 127.34, 125.82, 123.01, 122.57, 120.03, 118.55, 110.79, 109.83, 68.12, 54.76, 47.29, 40.33, 24.10. COCF3 resonances not observed. ¹9F NMR (189 MHz, CDCl3): δ = -75.95. HRMS (APCI): m/z [M - OCO2Me] calcd for C22H20F3N2O: 385.1528; found: 385.1507. Obtained according to general procedure E from 8c (1.00 equiv, 0.137 g, 0.317 mmol). Yield: 0.142 g (0.290 mmol, 91%); yellow foam. ¹H NMR (201 MHz, CDCl3): δ = 7.35-7.20 (m, 3 H), 7.11 (d, J = 8.9 Hz, 1 H), 7.05 (d, J = 2.3 Hz, 1 H), 7.03-6.96 (m, 2 H), 6.85 (dd, J = 8.9, 2.4 Hz, 1 H), 6.79-66.0 (m, 2 H), 6.07 (dt, J = 16.2, 6.1 Hz, 1 H), 5.33 (s, 2 H), 4.74 (dd, J = 6.1, 1.2 Hz, 2 H), 3.85 (s, 3 H), 3.77 (s, 3 H), 3.65 (dd, J = 13.2, 6.7 Hz, 2 H), 3.14 (t, J = 7.0 Hz, 2 H). ¹³C NMR (50 MHz, CDCl3): δ = 157.15 (q, J = 37.0 Hz), 155.41, 154.49, 137.48, 133.95, 132.65, 128.75, 127.82, 127.34, 127.08, 125.79, 122.74, 115.76 (q, J = 287.2 Hz), 113.38, 110.74, 110.39, 100.00, 68.18, 55.70, 54.78, 47.41, 40.24, 24.14. ¹9F NMR (189 MHz, CDCl3): δ = -75.93. HRMS (ESI+): m/z [M + Na+] calcd for C25H25F3N2O5Na: 513.1608; found: 513.1585. The appropriate allylic carbonate 9 (1.00 equiv) was dissolved in dioxane (50 mL/mmol) and Cs2CO3 (2.00 equiv) was added. The reaction was stirred for 16 h at 100 ˚C. After cooling, H2O (50 mL/mmol) was added and the mixture was extracted with Et2O (3 × 20 mL/mmol). After drying over MgSO4 and removal of all volatiles under reduced pressure, the crude product was purified by column chromatography to give the desired products 10. Obtained according to general procedure F from 9a (1.00 equiv, 0.020 g, 0.052 mmol) and purified by column chromatography (SiO2; pentane-EtOAc, 10:1). The product was isolated as a mixture of two isomers (ratio 1:7). Yield: 0.013 g (0.043 mmol, 82%); white solid; R f = 0.95 (pentane-EtOAc, 10:1). ¹H NMR (201 MHz, CDCl3): δ (major isomer) = 7.57-7.45 (m, 1 H), 7.38-7.23 (m, 2 H), 7.23-7.06 (m, 1 H), 6.23 (br d, J = 5.2 Hz, 1 H), 6.17-5.95 (m, 1 H), 5.48 (d, J = 10.0 Hz, 1 H), 5.09 (d, J = 17.0 Hz, 1 H), 4.17 (br d, J = 14.1 Hz, 1 H), 3.71-3.47 (m, 4 H), 3.12-2.74 (m, 2 H). ¹³C NMR (50 MHz, CDCl3): δ = 133.05, 130.56, 129.98, 125.93, 122.02, 121.22, 119.47, 118.26, 109.07, 107.83, 51.60, 39.91, 29.86, 22.15. COCF3 resonances not observed. ¹9F NMR (189 MHz, CDCl3): δ = -68.55 (minor), -68.99 (major). HRMS (APCI): m/z [M + H+] calcd for C16H16F3N2O: 309.1209; found: 309.1220. Obtained according to general procedure F from 9b (1.00 equiv, 0.037 g, 0.080 mmol) and purified by column chromatography (SiO2; pentane-EtOAc, 10:1). NMR analysis indicated the presence four isomers in a ratio 1.5:5:1.5:1. When investigated by variable-temperature ¹9F NMR spectroscopy, two of the observed resonances coalesce at 80 ˚C, while one of the other set of two resonances disappeared. Yield: 0.023 g (0.061 mmol, 76%); white solid; R f = 0.85 (pentane-EtOAc, 10:1). ¹H NMR (201 MHz, CDCl3): δ (major rotamers) = 7.53-7.41 (m, 1 H), 7.31-7.00 (m, 7 H), 6.95-6.83 (m, 1 H), 6.10-1.03 (m, 1 H), 6.01-5.81 (m, 1 H), 5.45-5.25 (m, 2 H), 5.18 (d, J = 10.3 Hz, 1 H), 5.13-4.87 (m, 1 H), 4.20-4.00 (m, 1 H), 3.63-3.42 (m, 1 H), 3.08-2.72 (m, 2 H). ¹³C NMR (50 MHz, CDCl3): δ (major rotamers) = 137.19, 136.86, 132.94, 128.99, 128.84, 127.54, 126.08, 125.78, 122.34, 121.24, 120.29, 119.74, 118.34, 109.96, 47.01, 29.70, 22.18. COCF3 resonances not observed. ¹9F NMR (189 MHz, CDCl3): δ = -68.91 (1.5), -68.97 (5), -69.04 (1.5), -70.17 (1). HRMS (ESI+): m/z [M + H+] calcd for C22H20F3N2O: 385.1522; found: 385.1511. Obtained according to general procedure F from 9c (1.00 equiv, 0.025 g, 0.051 mmol) and purified by column chromatography (SiO2; pentane-EtOAc, 10:1). NMR analysis indicated the presence four isomers in a ratio 2:6:2:1. See also comment to 10b. Yield: 0.017 g (0.042 mmol, 82%); white solid; R f = 0.65 (pentane-EtOAc, 10:1). ¹H NMR (400 MHz, CDCl3): δ (major peaks only) = 7.44-6.77 (m, 8 H), 6.11 (d, J = 5.4 Hz, 1 H), 6.07-5.93 (m, 1 H), 5.50-4.98 (m, 4 H), 4.25-4.12 (m, 1 H), 3.85 (s, 3 H), 3.67-3.54 (m, 1 H), 3.11-2.94 (m, 1 H), 2.93-2.78 (m, 1 H). ¹³C NMR (101 MHz, CDCl3): δ = 155.97 (q, J = 35.2 Hz), 154.29, 136.96, 132.96, 131.19, 128.98, 128.83, 127.52, 126.06, 125.95, 121.13, 116.52 (q, J = 287.7 Hz), 112.17, 110.77, 108.02, 100.46, 55.90, 51.76, 47.14, 39.92, 22.23. ¹9F NMR (376 MHz, CDCl3): δ = -68.91 (2), -68.96 (6), -69.02 (2), -70.18 (1). HRMS (ESI+): m/z [M + H+] calcd for C23H22F3N2O2: 415.1628; found: 415.1631. N-[2-(1-Benzyl-1H-indol-3-yl)ethyl]-2,2,2-trifluoroacetamide (3b; 1.00 equiv, 1.00 g, 2.89 mmol) was dissolved in Et2O (10 mL) and cooled to 0 ˚C. BuLi (3.97 mL, 6.35 mmol, 2.50 equiv) was added dropwise and the reaction mixture was allowed to warm to r.t. After 2 h, the reaction mixture was cooled to 0 ˚C, and acrylaldehyde (0.212 mL, 3.18 mmol, 1.50 equiv) was added. After warming to r.t., the reaction was quenched by addition of sat. Na2S2O3 (10 mL), the mixture washed with H2O (3 × 10 mL) and extracted with Et2O (3 × 20 mL). After drying over MgSO4, all volatiles were removed under reduced pressure to give the crude product, which was purified by column chromatography (SiO2; pentane-EtOAc, 7:3) to give 12. Yield: 0.523 g (1.299 mmol, 45%); yellow solid; R f = 0.90 (pentane-EtOAc, 8:2). ¹H NMR (400 MHz, CDCl3): δ = 8.14 (br s, 1 H), 7.62 (d, J = 7.6 Hz, 1 H), 7.37-7.10 (m, 6 H), 6.97 (d, J = 6.6 Hz, 2 H), 6.04 (ddd, J = 17.0, 10.4, 5.0 Hz, 1 H), 5.56 (d, J = 5.0 Hz, 1 H), 5.44 (d, J = 4.6 Hz, 2 H), 5.33-5.11 (m, 2 H), 3.64 (dd, J = 11.9, 5.0 Hz, 3 H), 3.37-3.08 (m, 2 H). ¹³C NMR (101 MHz, CDCl3): δ = 157.52 (q, J = 37.6 Hz), 137.81, 137.69, 136.81, 135.86, 128.63, 127.27, 127.24, 125.66, 122.47, 119.71, 118.37, 115.84 (q, J = 288.4 Hz), 115.52, 109.84, 109.69, 67.47, 46.83, 40.60, 22.47. ¹9F NMR (376 MHz, CDCl3): δ = -75.67. HRMS (ESI+): m/z [M + Na+] calcd for C22H21F3N2O2Na: 425.1447; found: 425.1456. This work was financially supported by the Dutch National Re­search School ‘combination catalysis controlled by chemical design’ (NRSC-Catalysis). M.F.-M. thanks the Spanish Ministry of Science and Innovation (MICINN) for a postdoctoral fellowship. 2 Dewick PM. Medicinal Natural Products - A Biosynthetic Approach 2nd ed. : Wiley; Chichester: 2001. N-Benzyltryptamine 7b could also be trapped with acrolein after lithiation to give secondary allylic alcohol 12 (Scheme 6). See the experimental section for details.